Two recent marijuana stock news stories show how companies can easily defraud investors. Today, we're going to show you two easy ways to spot these shady companies so your money is never in jeopardy. Here at Money Morning, we've been following two unfolding marijuana penny stock scandals. Back in February, a company called mCig Inc. (OTCMKTS: MCIG) – which sells e-cigarettes used for vaping cannabis – was accused of unreported insider selling. This was uncovered by Alan Rothstein, the founder of the website 420 Investor. He discovered a discrepancy in the company's 10-K filings, which are annual financial reports submitted to the U.S. Securities and Exchange Commission (SEC). CEOs have to file a Form 4 with the SEC when they sell shares, and Rosenberg failed to do so. An insider sale without formally filing and disclosing it to the public indicates Rosenberg may have been trying to mislead investors. If the investors knew Rosenberg dumped his shares, they would've thought something was wrong with the company and followed suit. This would've inevitably sent the stock plunging, which is something no CEO ever wants to happen to their company. Back in June, the SEC charged CV Sciences Inc. (OTCMKTS: CVSI), also known as CannaVest, with fraud. The charges are related to the company's CEO intentionally reporting false finances back in 2013. That year, CVSI was one of the top marijuana stocks on the market. Shares skyrocketed 700%, from $5 to $40, in 2013. They eventually peaked at an all-time high of $69.90 in January 2014. Since then, CannaVest stock has suspiciously lost most of its value. It's plunged 99.7% from that $69.90 record high to just $0.23 today (Friday, Sept. 15). Mona specifically said his company acquired PhytoSPHERE Systems – a biotech that makes hemp-based cannabinoids – for $35 million. Although this was the number Mona officially reported in the first half of 2013, he apparently knew the acquisition price tag was much lower. In fact, CV Sciences reported an acquisition value of just $8 million during the third quarter of 2013. That was 77.1% lower than the $35 million initially reported. This popped up on the SEC's radar, and the agency found that CannaVest didn't acknowledge how the original $35 million was overstated in Q1 2013 and Q2 2013. The agency claims this deliberate false recording is grounds for fraud, which is why the agency charged Mona last June. Since that penny stock story broke on June 16, CV Sciences stock is down 30.4%, from $0.30 to $0.23. If trading on CVSI is suspended, investors are at risk of seeing bigger losses than just the 30.4% loss they've already seen since June 16. They could even end up losing all of their initial investment because of CannaVest's irresponsible and fraudulent conduct. 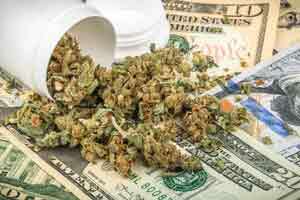 While marijuana penny stock scams like CannaVest can entice you to avoid the marijuana industry entirely, investors who do so could be missing out on massive profits. There are easy ways to find out if a pot stock is safe enough for your money.